I write that title with much optimism towards Liverpool's future despite last night's result. 5 games with no win, made even more frustrating by the fact that their overall pace and performance are evidently better than it has been all of last season... Whilst listening to the Florence & The Machine song of the same title. Although it can be argued that referee Mark Halsey played a crucial role in United's win for those 2 undeserved fines, the Reds simply wasted too many good opportunities that could've easily won them 3 points. Even with 10 men, they where threatening as Gerrard and Allen dominated midfield. Substituting young Suso was a good move in reshuffling the formation after Shelvey's dismissal (and for the record, it was a one-footed challenge on Evans, who should've also gotten a red in my opinion). Suarez, always resilient but often too enthusiastic, got the better of him - again. He needs to look up more when he's dribbling the ball around! And RVP, where were you before that penalty? Non existent. Barely a threat to our defense. All that plus home ground advantage, victory to the Reds was just as disillusioned as a mirage is to a weary traveler under the baking sun in the expansive desert. I'm not going to pretend to be an expert in the technicalities of football, in fact, part of the reason for me starting the blog was to improve my understanding of the game and to be a better writer. This article by Chris Bascombe pretty much nails it though. Whoever said golf was the most boring sport ever, has obviously never played mini golf! 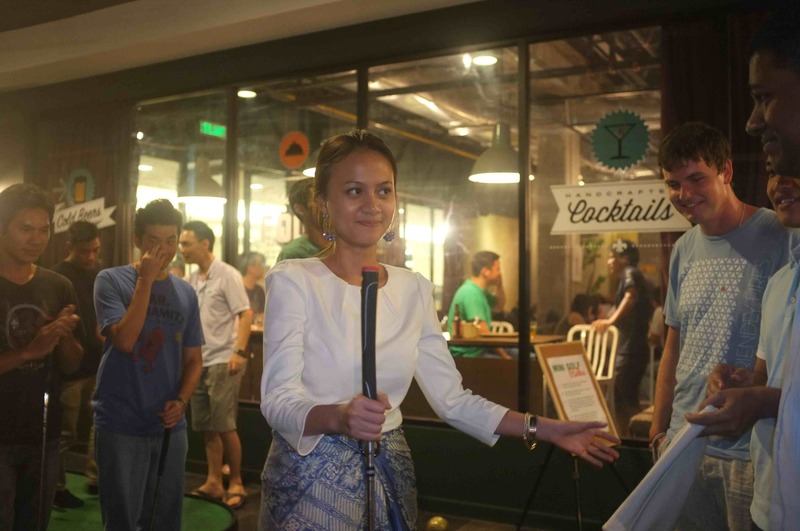 The Bee, Publika recently hosted a mini golf competition on their usual BBQ Sunday lineup with the good people from Green Putters. I love their tag line - bringing the grass to you. In case, you know, the cows got to them before you. I've turned out to be somewhat of a house cat lately, having lost touch with the cool and happening reality taking place outside my doorstep, because The Bee is all the buzz these days. See what I mean. 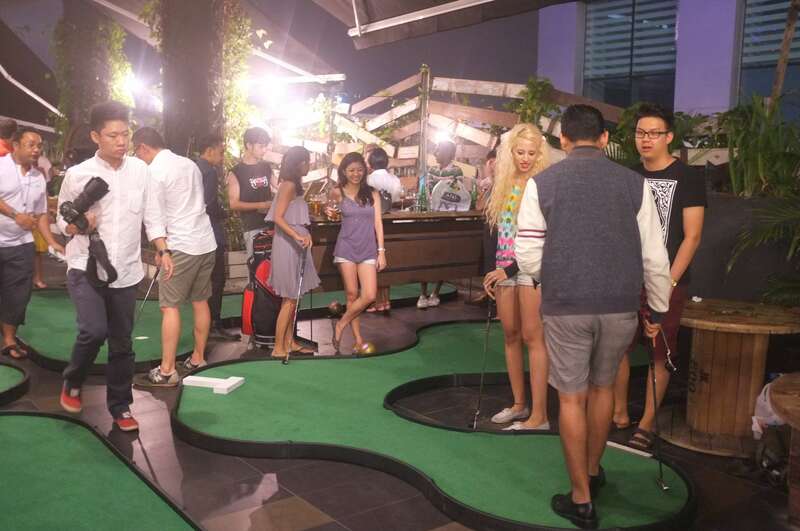 Everyone's cool and totally hip, effortlessly grasping a putter in their casual Sunday dress. I on the other hand am neither hip or dressed appropriately. Nor do I know what to do with a putter, apparently. To be fair I swung by from an open house. 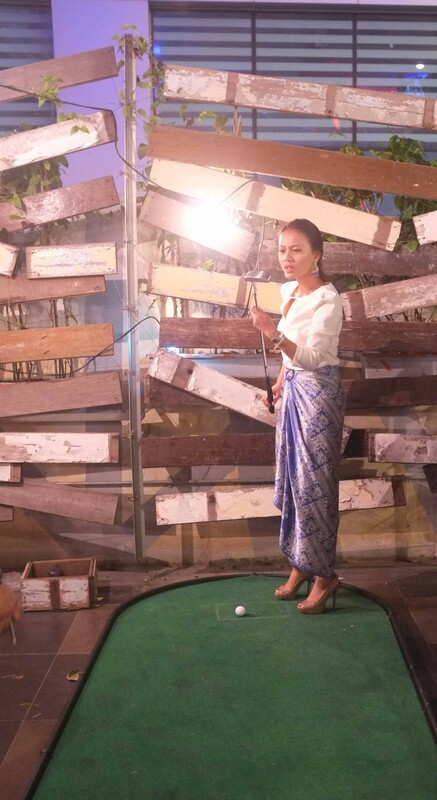 Lucky for me, those heels tuned my center of gravity just where it should be, to put me on par for the first 3 holes! 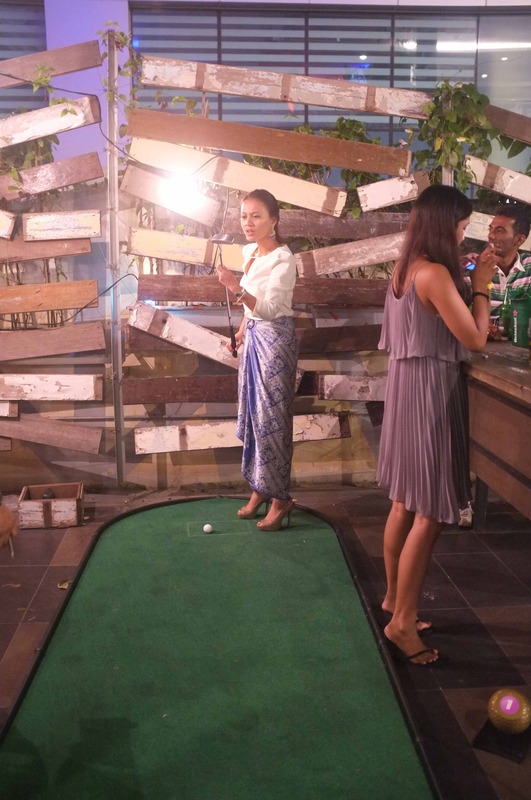 The aim of the competition was to stay on par (Par 2 per hole, 4 holes altogether) or less in the least amount of time and you'll walk away with a digital camera. I had my eyes set on a higher purpose though - bragging rights! I was up against 6-7 guys from Sayfol (ex-school mates) who were sooo confident I'd mess up my shots. After my 2nd par they were in awe. The first they thought was a fluke. By the 3rd par, their jaw literally dropped. How could a girl who didn't know how to hold a putter beat them?!? Thank you heels. *waves hand in the air* "Thank you, thank you very much..."
The glory lasted all of 3 holes. On the 4th, I got all jittery from the pressure and scored 4 over par. 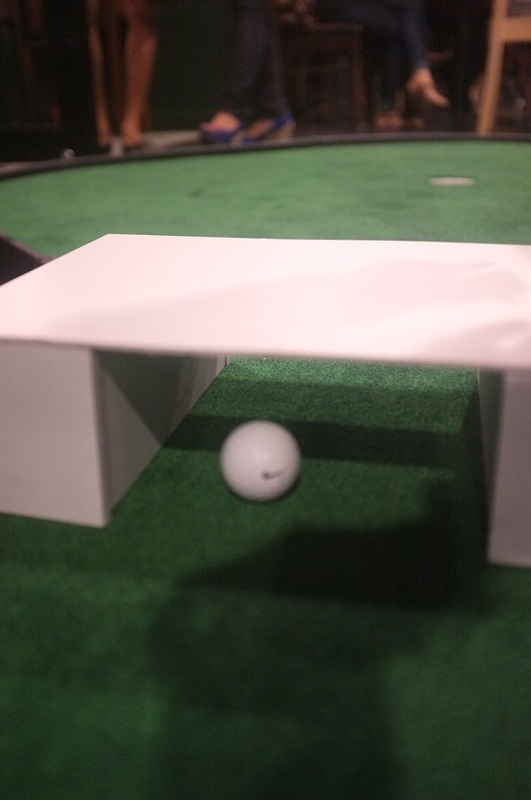 I blame the course - it was impossible to get the ball through this itty bitty obstacle. So close. My overall score was 12. No camera, no bragging rights but enough to rival the boys' score. Maybe I'll apply to be her life coach instead, and teach her to wear heels on the green. I have come to believe that I was a distressed damsel locked up all alone in a dark and dingy tower (think Rapunzel, minus the long hair) decorated with grotesque gargoyle carvings on the side (think of the castle in Beauty & Beast) in a previous life. In consequence of that tortured past, I have returned with a vengeance. Glittering skyscrapers, buzzing neon lights & effervescent energy are the brick and mortar of this vengeance! 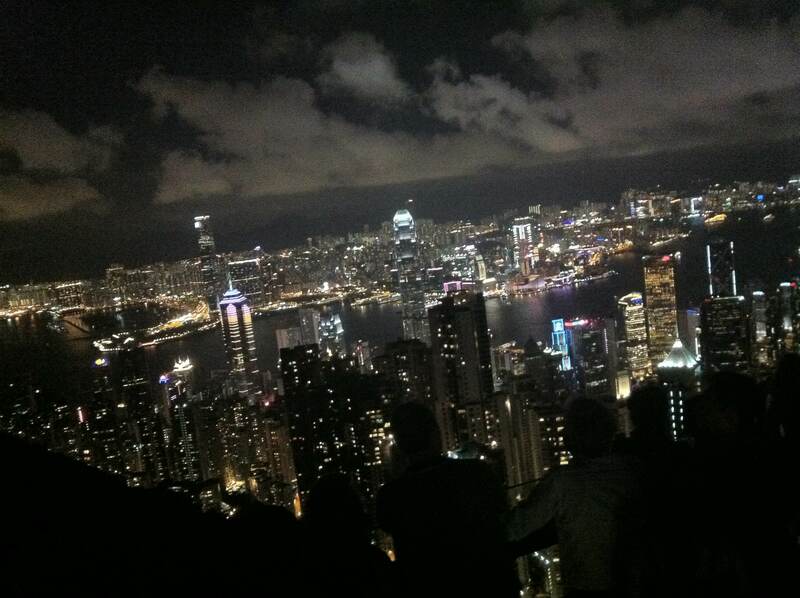 When in Hong Kong, do not ever, and I mean EVER, miss an opportunity to visit The Peak. This is my 3rd trip to the island, but 1st up the Peak's Sky Terrace, and boy have I missed out all this while! Having just returned from New York in July, the view of Manhattan's skyline from Rockefeller Center, pales in comparison. Don't get me wrong, NYC is spectacular and in a class of its own. It's the vantage point which encapsulates the essence of a city in all its glory - is where The Peak wins. 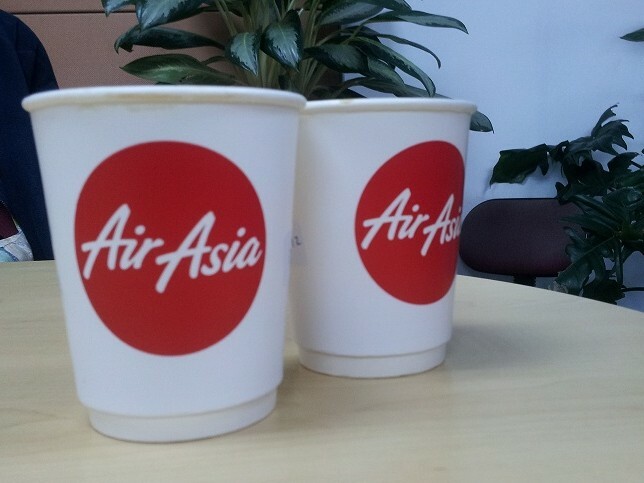 I urge you to log on to airasia.com (shamelessly plugging!) to book your flight right this instant. You won't regret it! 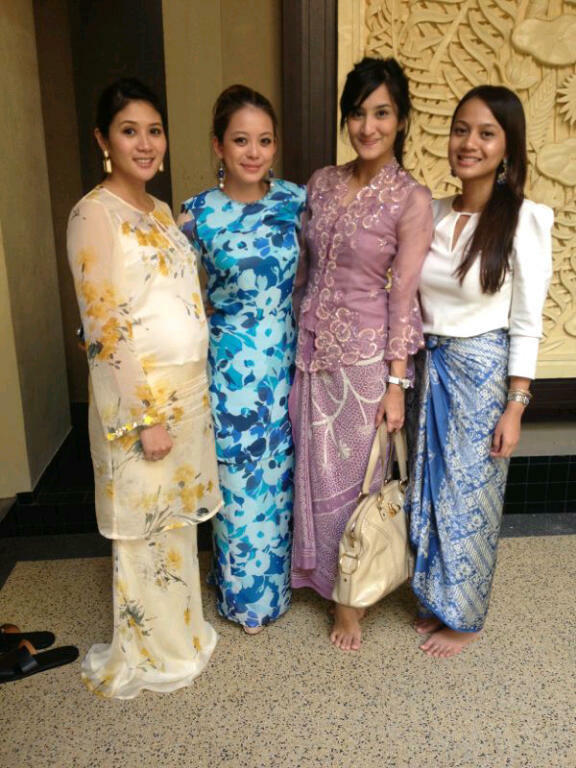 Now, I may love raya but my hips on the other hand, have other ideas come this time of the year. No matter how much cardio/weight/resistance training I do to combat the dreaded flabs - my hips insist on giving Bibendum (yes, the Michelin tyre mascot has a name!) a run for his money. 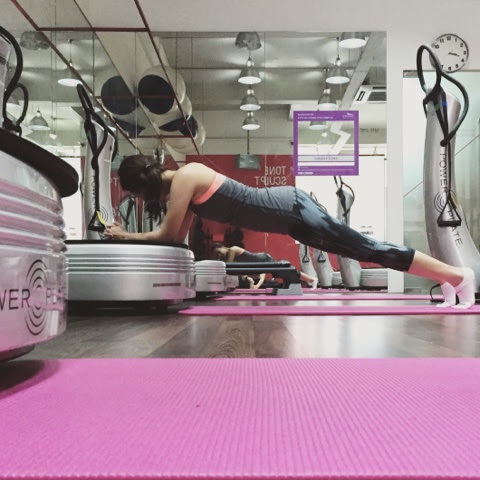 But let's be honest here, I've probably only visited the gym twice in the past month in the midst of work, travel, events and open houses! On the other hand, house visiting is the best time to catch up with friends and acquaintances you haven't met in awhile. It's like hitting 2 birds with one stone. Or 23 friends. Or 4297 family members. On to Exhibit B: Always wear those big spacious kaftans. They're comfy enough to fit in as much rendang into your bellies yet stylish enough to pull off that effortless cool look. As previously stated, no I don't wear those tiny red uniforms - wouldn't do them justice anyway with my height, more like lack of it. But it does include a lot of traveling, especially around the region. As you know AirAsia has expanded tremendously in its young 10 year history and have established offices or A.O.Cs (Airport Operator's Certificate) in Indonesia, Thailand, Philippines and Japan. The biggest advantage of obtaining an A.O.C is the license t0 fly commercial, domestically. For example: Airline M does not have an A.O.C in Indonesia. Thus it can fly from KL to Jakarta or KL to Bali but not Jakarta to Bali. In essence, whatever services and products that are developed here in Malaysia has to be replicated in the various countries to capture the local market. Hence the traveling. Will go in depth on my specific role and responsibilities in another post. One of it though, does include the occasional food testing. On today's menu: coffee! The perfect pick-me-up after a long work week. 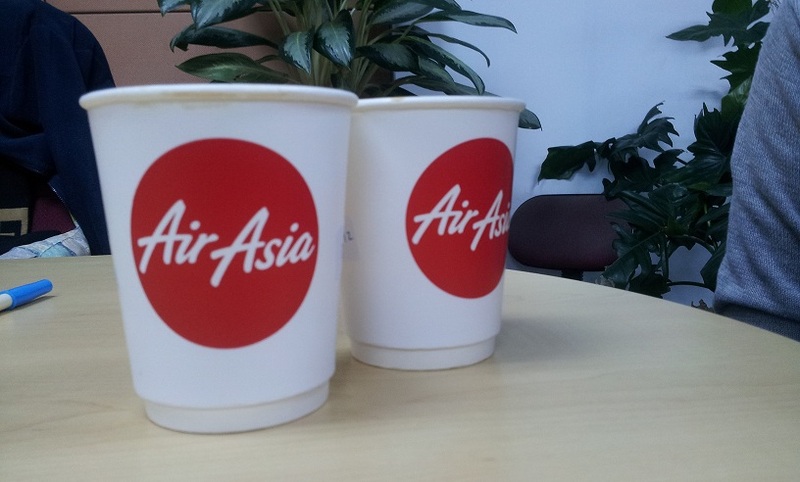 Won't be long before you get to purchase a cuppa from one of the biggest coffee chains in the world (hint: not the green mermaid) on board your next flight! Now I'm all set for the weekend!!! We are all too familiar with the historic bitter rivalry between Manchester United and Liverpool that goes waaay back before you and I were born. Possibly way before the current Queen Elizabeth's great grandfather (George V) was born too. Was football established as a professional sport back then yet? Will need to look that one up. Anyway, you get my point. 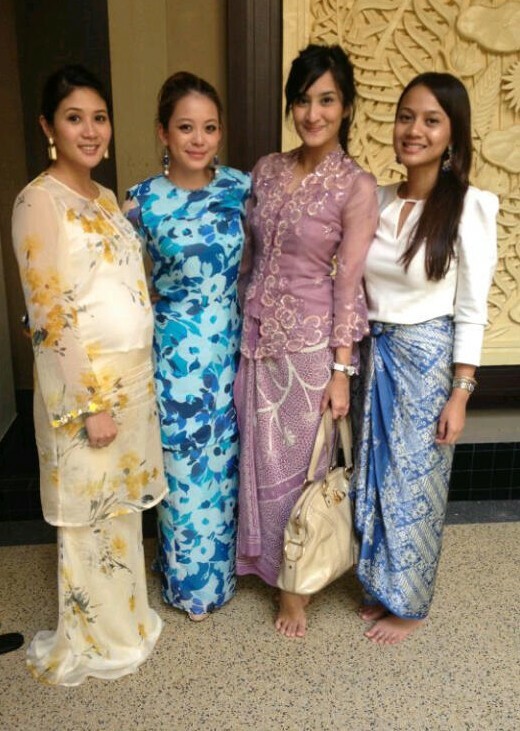 Our only connection to the Brits are that we were an ex colony (oh, hope it's not too late to wish everyone a happy Merdeka! Geez I've been away far too long). We don't live in Manchester/Liverpool. We did not go to the same school as Gerrard or Scholes. Eat at the same restaurants. Walk the same paths. Buy shampoo from the same pharmacy. Nope. Nada. Yet our loyalty to the beautiful game and the teams we support run skin deep. One of the few things I usually ask a person I just met is, 'Do you watch football?'. If no, blahhh you're not worth knowing. If yes, 'What team do you support?' Manchester United. *not another one* Double blaaaaaah. Even more not worth knowing. I'm kidding. Ok, only half kidding on the United part. In short, 'pool & Utd do not make best friends. Friends even. It's like Romeo & Juliet. Montagues don't mate with Capulets and if you do, you both kill yourselves in the end because everyone you ever knew will disown you. But I'm going to go ahead and be my own Shakespeare with a serve of peace, love and unicorns (just because) on the side. One of my closest friends in the world is the devil herself. And yes, I laaaav her! We're like twins literally. 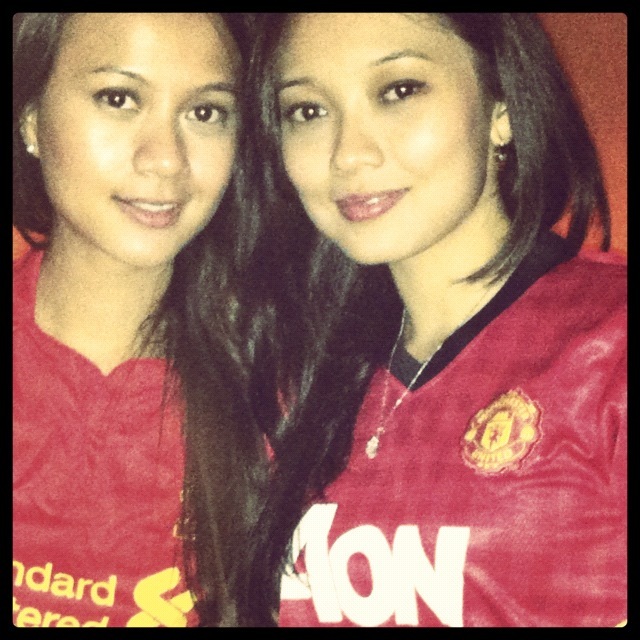 Complete girls who love our fashion, beauty and all the things girls are into and yet, completely into football. We could catch up over coffee one weekend and talk entirely about transfers, managers, formations gone wrong, players lives on and off the pitch etc without batting an eyelash. Since our hotel didn't show the match we headed to a bar at Soho to have pizza while watching the games. Liverpool vs Arsenal first (boo, for the loss. Why did we loan off Carroll again? Doesn't this new formation call for a player like him? Sigh. Be patient my lovers) followed by Southampton vs Man U. 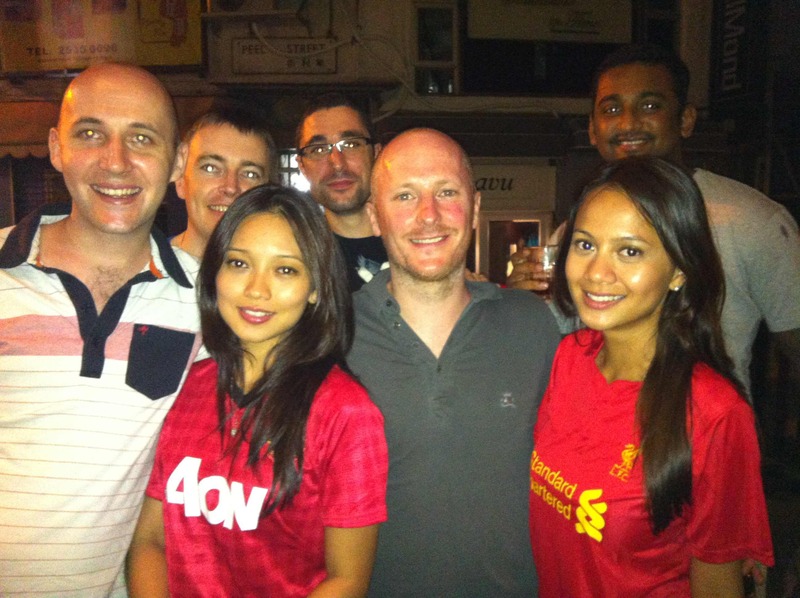 We made friends on our little outing, if I remember correctly 2 of them were United, the other 3 Gunners. And guess what! The guy on the far left is Jamie Merrick, grandson of Gil Merrick, an ex player for Birmingham & England who later went on to become a manager. The city of Birmingham even named their Railway Stand at the St Andrew's stadium after him (Gil Merrick Stand) in his honor. He mentioned this story to us, as his claim of fame when he figured we were the real deal (as far as football goes).